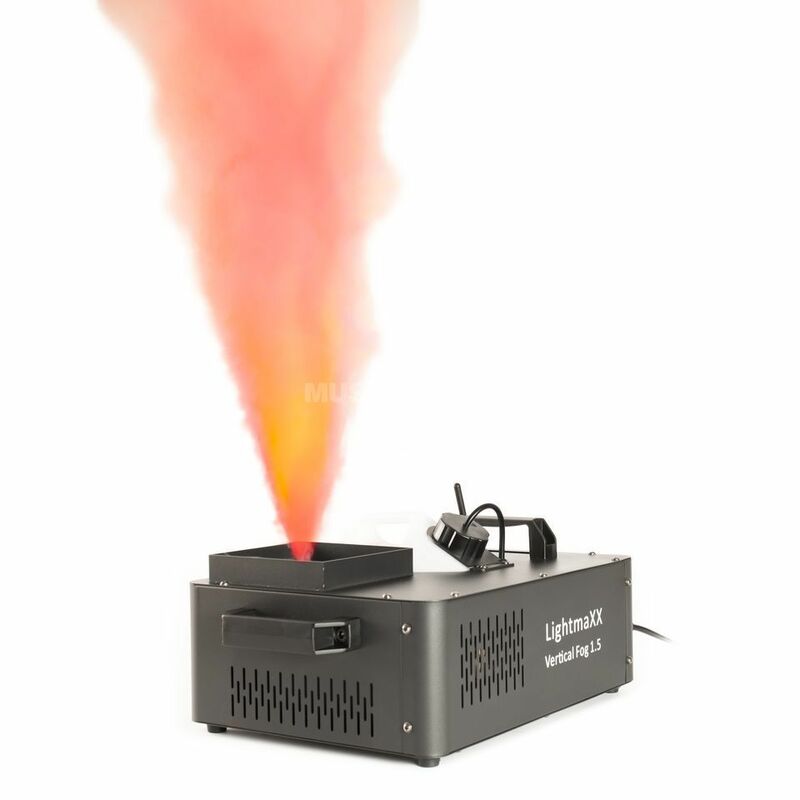 The lightmaXX Vertical Fog 1.5 is a vertical fog machine with a heating block of 1450 Watt and a beautiful LED-RGBA lighting which is protected from moisture with a special foil. The lightmaXX Vertical Fog 1.5 is manufactured in a simple aluminium housing in black and convinces with the functions that are built into the housing. The 1450 watt heating block is milled from one piece of aluminium, which brings some advantages such as the vertical fog machine has no long reheating times between fogging processes and the heating block lives longer than conventional heating blocks. To such a high quality heating block also a very strong fluid pump was installed, this reaches an output of up to 17 bar, so an output height of up to 6 meters can be easily reached. In order to control and monitor both components safely and reliably, a microprocessor was installed. Around the nozzle for the fog output, a total of 12x 3 Watt RGBA single color LEDs are used to immerse the fog in a beautiful light. To protect the LEDs from fluid residues and moisture, a special adhesive film was used. This ensures that the LEDs are protected from moisture and that no fluid residues can enter the LED unit. Of course, the lightmaXX Vertical Fog 1.5 can be controlled via any DMX lighting console in the conventional way and requires a maximum of 8 channels. A radio remote control is included with the Vertical Fog 1.5. This is not a conventional remote control as it is included with other machines but offers some functions. At the control unit, where the DMX address is also defined, many functions of the remote control can be defined. For example, different colour macros can be set for each button or vertical fog machines can be controlled in groups. This makes the machine unique on the market. Please note that using the wrong fluid will void the warranty! Please use only the lightmaXX Vertical Fog Special Fluid or the Antari FLC-5 Fluid.